2 tone Didi, originally uploaded by simplyangelic2010. 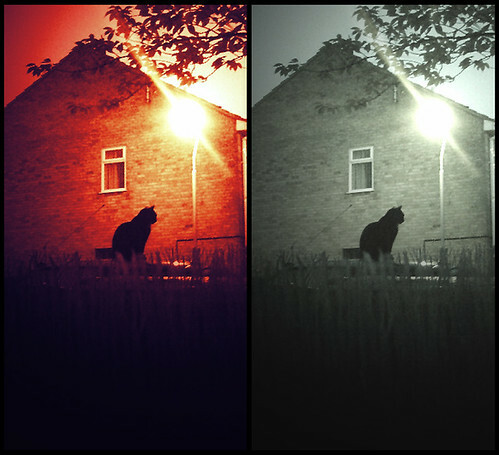 Was messing about with photoshop using a picture I took a couple of evenings ago. It was the most perfect night, warm and sultry, as every evening should be. One of my cats was enjoying the it too, snoozing on top of our car, so I grabbed my camera and took a quick snapshot. I loaded it into Photoshop and played around with lighting etc and this was the result. 4 Response to "Photo of cat at sunset"
That's a really great pic it's amazing what you can do with photoshop well done Beth I like that!